In order to understand rightly the reason why the Holy Church calls Mary our life [in the Salve Regina: “our life, our sweetness and our hope”], we must consider that as the soul gives life to the body, so divine grace gives life to the soul. For a soul without grace, though nominally alive, in truth is dead, as we read in the Apocalypse: "Thou hast the name of being alive, and thou art dead" (3:1). As Mary, then, obtains the gift of grace for sinners by her intercession, she restores them to life. The Holy Church applies to her the following words of Proverbs: "They that in the morning early watch for me, shall find me" (8:17). They shall find me, or, according to the Septuagint, "they shall find grace" - Invenient me, invenient gratiam. St. Bernardine of Sienna says that God did not destroy man after his fall because of the special love that He bore His future child Mary. 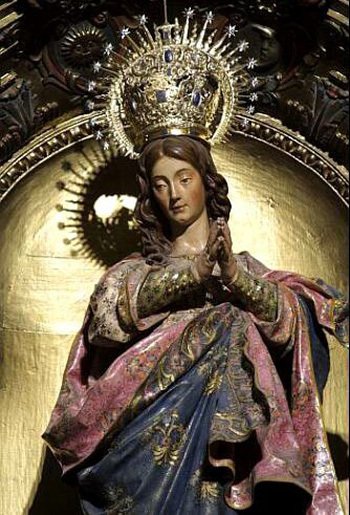 And the Saint adds that he is certain that all the mercy and pardon which sinners received under the Old Law was granted them by God solely for the sake of this Blessed Virgin (Tomus 4, sermo 61, CS). Therefore St. Bernard exhorts us, if we have been so unfortunate as to lose divine grace, to strive to recover it, but to strive through Mary. For if we have lost it, she has found it. And hence she is called by this great Saint, "The finder of grace, inventrix gratiae”. 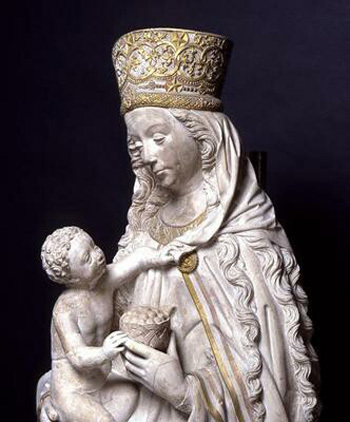 Mary sang: "For behold, from henceforth all nations shall call me Blessed." On this account, says St. Bernard, all nations shall call thee Blessed because all thy servants by thy means shall obtain the life of grace and eternal glory: "In thee sinners find pardon, and the just perseverance, and afterwards life eternal" (Sermo de Nativitate B.V.) . St. Andrew of Crete calls Mary “the security of divine pardon." By this is meant that when sinners have recourse to Mary, they may be reconciled to God. God assures them of pardon, and gives them the assurance by also giving them the pledge of it. And this pledge is Mary, whom He has given us for our Advocate. No sinner needs ever fear that he shall be rejected by Mary if he has recourse to her mercy. No, for she is the Mother of Mercy, and, as such, desires to save even the most miserable. Mary is that happy ark in which he who takes refuge will never suffer the shipwreck of eternal ruin - arca in qua naufragium evadimus. Even the brutes were saved in the time of the Deluge in the ark of Noah. In like manner, under the mantle of Mary, even sinners are saved. St. Gertrude one day saw Mary with her mantle extended, beneath which many wild beasts, lions, bears and tigers had sheltered themselves. And Mary not only did not cast them from her, but received them with pity and caressed them. And by this the Saint understood that the vilest sinners, when they flee to Mary, are not cast out, but welcomed and saved from eternal death. Let us enter, then, into this ark and seek refuge under the mantle of Mary. For she certainly will not reject us, and will surely save us.